Imagine a summer breeze, the wind gently blowing through your hair, the salty, sea-weedy smell of the sea, your eyes gazing into the distance watching the beams of sun light shooting out from the sky. Now add the sound of the waves hitting the shore, the cries of sea gulls and some groovy beach music in the background. The only thing that is missing is in this picture is the company of good friends, tantalizing food and refreshing summer drinks. I love summer and I adore the sun. Perhaps it’s because of all those gloomy, rainy days here in the Netherlands, that the sun has almost reached a Goddess status. When the sun’s out, I chase it around and grab every single opportunity to be outside. I take my laptop with me and sit outside at a local café, while I work. I love reading a book or studying in the park, having a picnic or going for a long walk on the beach, riding my bike or simply sitting outside and sharing a bottle of wine with a friend. I love hot summer days in Amsterdam. When summer arrives in the city, the city and its people become alive. On a sunny day the green parks are packed with people playing, laughing, talking and hanging around. If not in the park, you wil find people sitting outside on a terrace on one of those typical Amsterdam squares enjoying a drink with friends while watching the hustle and bustle of the city, people and traffic rushing by. Before I started doing yoga and exploring the relationship between food and my health, a typical summer night would generally include drinking beer or sharing a good bottle of wine with friends. If you look around in the parks or on the squares of the city, you will see most people drinking alcohol on a summer evening. Although I still enjoy a good glass of wine occasionally, I sometimes just want a healthy and equally delicious alternative. Summers to me are all about enjoying all the beauty nature has to offer: fresh air, the warmth of the sun, being outside, eating healthy and fresh nutrient-dense foods and enjoying refreshing healthy drinks. If you go to a bar or even to a party at a friend’s place, it’s not always easy to find a healthy alternative to drinking alcohol. I recently was at a beach bar and was overjoyed to find they served green juices. That’s the exception though rather than the rule. Most of the time the only non-alcoholic choice you have is to drink a sugary mocktail or a soda. The healthy choice is often a plain glass of water with a slice of lemon, a glass of freshly squeezed OJ or a cup of tea. Sometimes I just want something a little bit more special than that. Ever wondered what to drink when you are not drinking? Recently, I have been experimenting with creating alcohol-free, home-made drinks whenever I throw a party. More and more of my friends are drinking less alcohol or not drinking alcohol at all. Instead of putting an extra bottle of mineral water or soda on the table, I have been making delicious home-made lemonades, non-alcoholic sangrias, iced teas and fruit waters. This is the first time I’ve tried my hand at creating mocktails based on cocktails and flavors that I love. 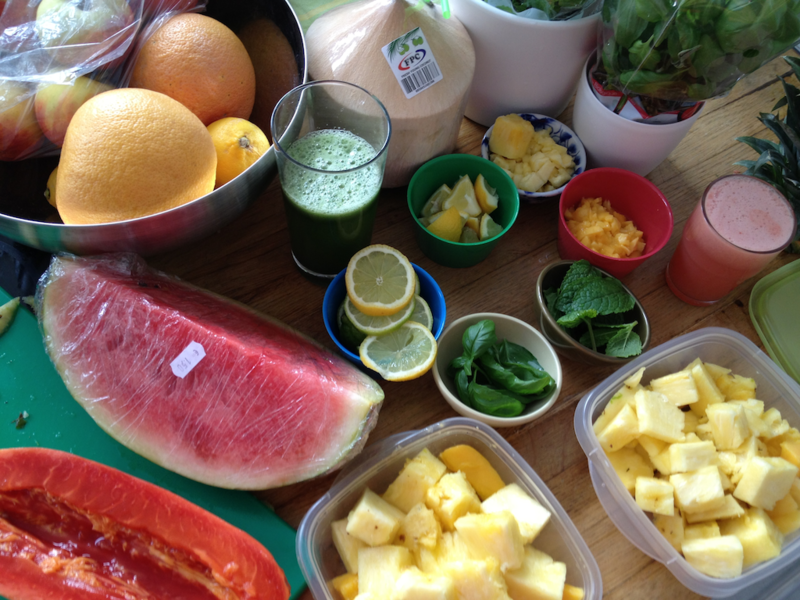 These mocktails are not only delicious but they are really healthy too. They are made with honest and natural ingredients, such as botanically brewed organic lemonades, fresh fruits and herbs. They taste too good to be true. And the best part is that you can have as many as you like without getting an alcohol-induced hangover the next morning. You won’t even miss the alcohol, but if you do want to spice things up, I give you that option too. In some of the cocktails I have given the option of using coconut sugar because I like that grainy sugary feeling of a good mojito. However, if you don’t like it too sweet, you can skip it altogether or use a little agave nectar instead. 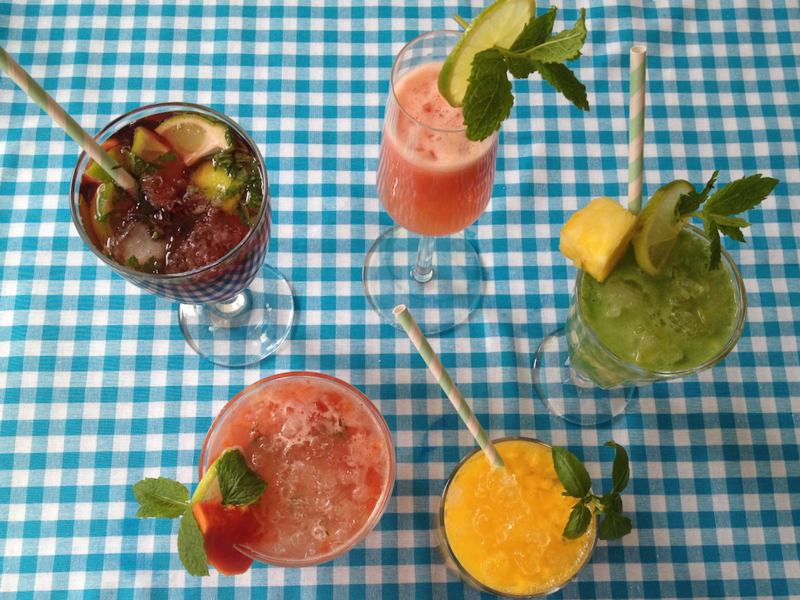 So whether you go mocktail or cocktail, these drinks guarantee a good evening with sunshine, food and friends. 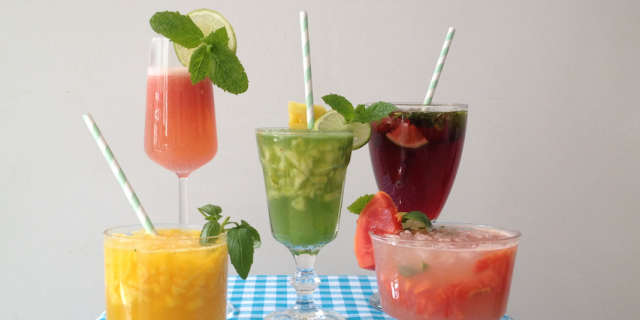 You can enjoy these mouth-watering summer mocktails guilt-free, have as many as you like, party all night long and still wake up feeling fully refreshed and alive the next morning. Why waste a beautiful sunny day on a hangover? 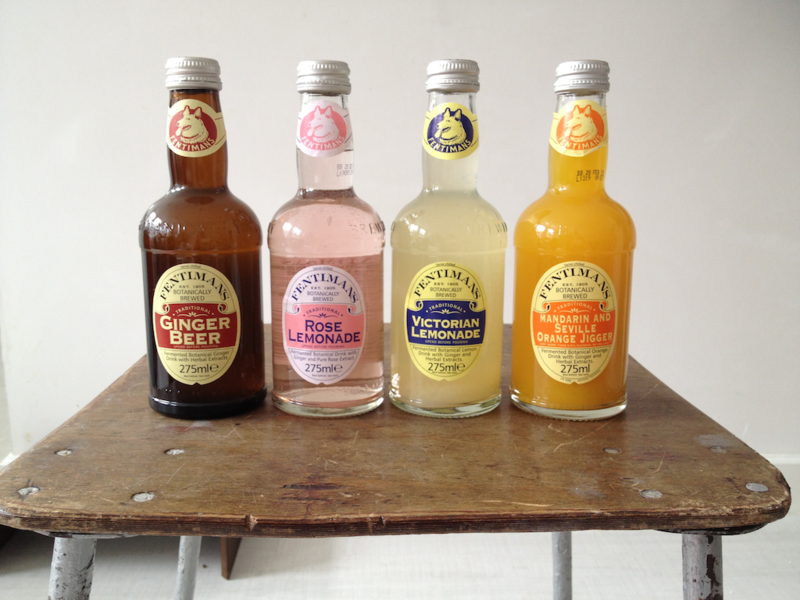 In my cocktails I use Fentiman’s lemonades and cocktail mixes. They are made with the finest natural ingredients and flavorings and that’s exactly what you taste: real fresh fruits, plant roots and herbs. The Rose Lemonade, Ginger Beer and Mandarin Seville Orange Jigger are my favorites. I buy them at one of my favorite shops/lunch places in Amsterdam, Cottoncake. If you can’t find the Fentiman lemonades near your home, Marqt sells Luscombe organic lemonades. Luscombe lemonades offer great quality too. I love the Sicilian Lemonade, Hot Ginger Beer and the Elderflower Bubbly. They are just as delicious as the Fentiman brews and they are also made with the finest ingredients from (mostly) local and organic sources. If you are eliminating refined sugars from your diet or struggle with sugar imbalances, use sparkling water instead and skip the sugar in these recipes or use agave nectar instead. With alcohol: skip the sugar and add some bubbles (sparkling dry white wine, Cava, Prosecco or Champagne). Serve in a champagne glasses. Note: If you are abstaining from alcohol, please note that Mandarin Seville Orange Jigger contains a very small percentage (0,5%) of alcohol due to the fermentation process. Add ingredients to a cocktail shaker, shake well and pour into a long drink glass.